book's talented illustrator Keika Yamaguchi. 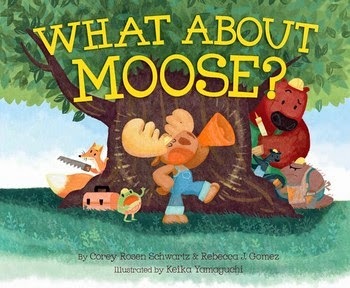 Keika is the illustrator of the picture books SICK OF BEING SICK, PUDDLE PUG, and now WHAT ABOUT MOOSE?! She lives in Los Angeles, CA. You can find more about her and her art by visiting her website, Keika's House. The characters in What About Moose? are all so adorable. I especially love Toad, with his little goggles. Do you have a favorite? I must say, my favorite is the Moose. He's has a interesting personality, and has a squishy bottom! Aw, Moose is so happy that he is your favorite! 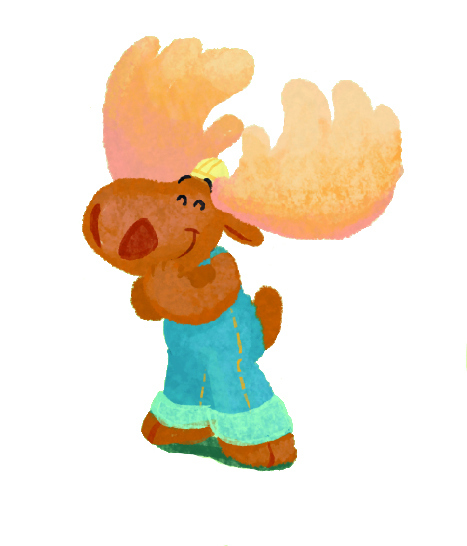 What was the most challenging part of illustrating Moose's story? Some of the most challenging part of illustrating this story was to find a step by step instruction of how to make an actual treehouse or playhouse. I tried to find one that has similar instruction to the way the manuscript was written. All the terms for construction, I was not familiar too so I had to look them up as well. That was a challenge in the writing of the story too, Keika! I love that you added your own vision to the illustrations, such as including characters that aren't mentioned in the text, but still become part of the overall story. How do you decide what kinds of extra touches to add? Thank you! I decided to add the side characters to help emphasize that Moose's behavior are rude. It is disruptive to not only the opinions of his friends but also from perspective of others. I usually look to add extra touches like these to help get the sense of the world/setting that the characters live in as well. What do you look for in a story when deciding whether to pursue an illustration project? So far, I had been pursuing a project that I get a vivid vision when I read the manuscript or when I am drawn to the main character in the story. 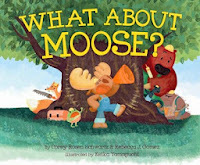 When I picked up the manuscript for Moose, I couldn't help but giggle! First, as I read the manuscript, next to each page break, I jot down as many visions that naturally come to me with pencil in as rough thumbnails. Then I slowly narrow it down to number of pages there are suppose to be in the book. Once I have the compositions I want, I then scan them into my computer, expand the size of each spreads to actual size of the book and print them out and draw on top of them, and staple it together into a book format, and flip through them. Making sure that the pages flow well together. Once I like how it looks, then I clean them up and send the images in for approval. Upon getting the confirmation, I paint. For Moose, I used Photoshop. Have you always pursued art? What made you decide to become an illustrator? No. I decided to pursue art within my last few months of senior year in high school. Until then, I was pursuing music. I was trying biology as well, but I learned that I was horrible at memorizing all the terms, I decided to back out of it. I knew I wanted to do something with art during college, but I didn't decide to pursue as an illustrator until I had the opportunity to work on Sick of Being Sick, where I rediscovered my passion for children's books. Do you have a favorite picture book? A favorite illustrator? One of the books that is most close to my heart is called MISS NELSON IS MISSING by Harry Allurd and James Marshall. When I was about 7 years old, I was very behind with my use and understanding in English because it was my second language, and it had been only few years since I came to the U.S. I usually stayed away from reading, but this book, I really wanted to understand what was written in it. During the story time at the school library, my classmates looked so focused and laughed so hard as the librarian read out loud. I was determined to read it, and with the help of easy to read text, and the size of the text helped me finally read and understand an English language book all by myself. I was quite proud and very happy with myself. As far as your question about a favorite illustrator, right now I can't get enough of Michael Sowa. My next book, TEENY TINY TOADY, written by Jill Esbaum, is coming out next Spring. I'm also working on writing my own stories as well. Awesome! Considering how much I love Toad in WHAT ABOUT MOOSE?, I can't wait to see what you do with this toad! And how neat that you are pursuing writing too. Thank you so much for agreeing to this interview, Keika. Here is to the success of our little bossy Moose and all of his friends! chance to win a signed copy.